My daughter is only in Kindergarten, but that doesn't mean her education hasn't come with a few challenges already. Luckily, we've been able to fix those problems quickly and carry on. But moving out of state during her first school year also created a new set of challenges. One being what school she would be attending and how she would respond to it. We were lucky enough to move into an area where we had a few options to choose from, but definitely one school stood out in particular. This school however came with quite of few requirements that involved several assessments and evaluations. It might have seem daunting to some, but when it comes to Arianna's education, we would never think of settling. I'm glad we didn't either, because since entering this school she's been doing great! 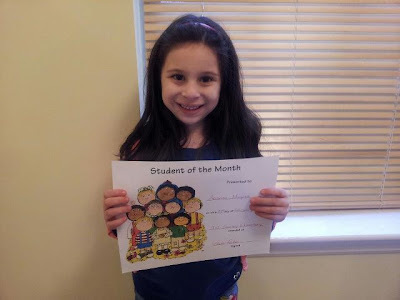 Some of you might even remember she won the Student of the Month award in February! It's an amazing accomplishment for her and we couldn't be prouder. It also makes me extremely grateful that we followed our instincts and pursued this school, because when it comes to your kids - you should never settle for less. When it comes to your tax return, you never have to settle for less with H&R Block. Filing your taxes with H&R Block just became an event worth sharing. Get started now for your chance at instant cash prizes and the $100,000 refund! There are winners every hour. So file your taxes then let your friends know how rewarding it can be. Time is running out! Make sure to file before tax day (4/17) and to be entered in the H&R Block Sweepstakes for a chance to win a $100,000 Refund! Customers who completed their taxes using H&R Block at Home can instantly win one of the hourly drawn cash prizes and be entered to win a $100,000 grand prize refund. Once entered into contest, participants can tell their friends about it via Facebook, Twitter, and Google+. To enter, complete a tax return online via computer or tablet device using H&R Block At Home tax preparation. NO PURCHASE OR PAYMENT OF MONEY NECESSARY TO ENTER OR WIN. A PURCHASE WILL NOT INCREASE YOUR CHANCES OF WINNING. H&R Block® –100,000 Refund Giveaway starts 1/17/12 at 12:00 P.M. (midnight) ET and ends 4/17/12 at 11:59:59 PM ET. For Official Rules, to learn how to obtain a free means of entry without purchase, to learn how to play the instant win game and enter the sweepstakes, drawings, prize details, odds of winning, restrictions, etc. click here [www.hrbathomegiveaway.com]. Open to eligible legal residents of 50 US/DC, 18 years or older at time of entry. Void in P.R. and where prohibited. Sponsor: HRB Digital LLC, One H&R Block Way, Kansas City, MO 64105.